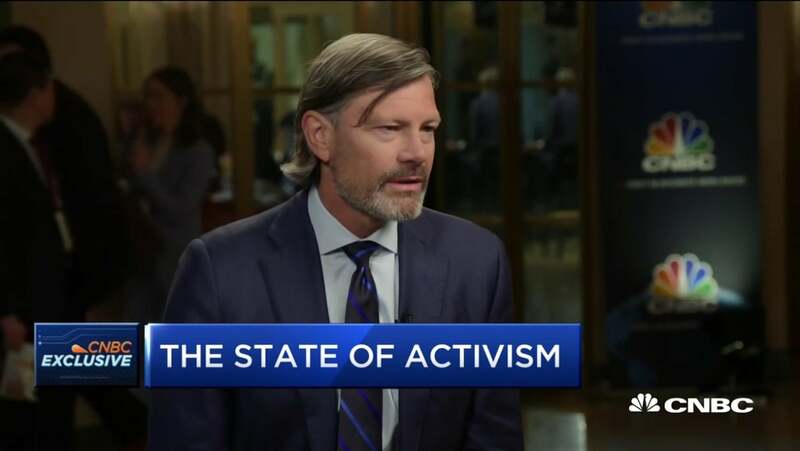 MORGAN BRENNAN: Welcome back to “Squawk Alley.” Some of the biggest names in hedge fund activism are gathering this morning in New York City as the annual Active-Passive Summit kicks off. David Faber is there live and joins us now with another exclusive interview, ValueAct’s Jeff Ubben. David. DAVID FABER: Thank you, Morgan. That’s right, I am joined by Jeff Ubben. And we were saying, it’s the first time I’ve — we’ve actually sat down, you and me at least, in some time. Since that Microsoft investment, I think. JEFF UBBEN: I play hard to get. DAVID FABER: It’s funny, though. The firm has changed. Your role has changed. You’re no longer CIO of ValueAct. You are still of course its Founder and CEO. You’re very focused on ESG. But, activism itself, you at an activist conference, but I don’t even think of you as an activist any more. Should I? JEFF UBBEN: — and so, then, we just kind of get to the punchline and say, ‘You know, we think you should refresh your board,’ or, you know, ‘Why don’t you call your top ten shareholders and ask them what they think?’ And most of those guys know us. And then you have a conversation and you can get it done without a bunch of yelling and screaming. That’s the way we like to do it. You kind of hit the ground running when you’re in the room. You know, it is travel intensive. I You know, in Japan we went on the — we put one of our partners on the board of Olympus Medical, the first time a shareholder director has gone on a Nikkei 225 board. JEFF UBBEN: And it’s two years’ worth of work. You know, you visit with the FSA. You visit with other leaders, corporate leaders in the community, as well as the company to gain their trust. And, you know, that’s the way we do it. DAVID FABER: Yeah, now, you benefit from the fact that you have locked up money. I mean, you have long-term capital as opposed to some activists or those that seem to have much shorter-term money. It goes up and down. Marketing seems to be a big part of the whole endeavor. JEFF UBBEN: I think the incentives are everything, you know. So, if you have one-year capital, you want to make it happen fast and so, you write letters. And you get it done. And there’s many ways to skin a cat. You know, we’re just doing it differently. JEFF UBBEN: Some of it is temperament. You know, you don’t like lawyers in your life so much or whatever it is. You know? DAVID FABER: Forget activism, how about active management. Is it dead? JEFF UBBEN: Feels hard. I don’t know how much of the bid every day is really somebody that’s buying intrinsic value on the other side, which it feels like computers to computers. And December was kind of just the race to the bottom. I think computers talking to computers. There’s this huge kind of volatility around quarterly earnings that didn’t need to exist. I don’t, you know, it seems like somebody wants to beat somebody else to the punch on headline earnings and stuff like that, which rewires the brain of directors and they think again quarterly earnings is really important. But, so, it’s a little different, you know. I feel like maybe a bit of a dinosaur, maybe. DAVID FABER: Are you — well, value is still the first name in your firm’s name. Can you be a value investor in this market? Or can you only be one when you have long-term focus and locked up capital? JEFF UBBEN: It does. It has gone on a long time. The long bond at 2% for this long has created a market that seems to be difficult for value investors, you know. There’s always a worry about the next cycle and high-quality businesses can kind of revalue higher and higher because they’re treated as bond substitutes. DAVID FABER: Well, you’ve changed your focus to some extent because you’re very focused on well, ESG for lack of a better term. You have the spring fund. Can you actually earn a return by making investments that are also are conceivably good for the planet? JEFF UBBEN: Right. I have an investment theory that we went financial capital short and social natural capital long in the ’70s, which made sense because we were building out the industrial economy, it was a material short world. And so, the returns accrued to those that allocate well against the scarce asset. That’s kind of when we codified the whole concept of return on capital, because that was particularly important when interest rates were 15% and tax rates were 70%. Everything’s flipped, and today, you know, finance abundant, free money, low taxes, less return accrues to the abundant resource, the scarce resource is human/social natural capital. And so those companies that can and this is where I get active in boardrooms, that can better address and think more deeply about environmental and social goals and needs, I think that’s going to be where the breakout return are over the next 20 years. DAVID FABER: And how do you approach that then? And what are you looking for in terms of at least the particular aspects of a conceivable investment that speak to you about it? DAVID FABER: That day could be far away, Jeff. I mean, it seemed like it was near but if the Trump administration certainly has its way and continues to, let’s say, for the next five years, five and a half years there’s not going to be a price on carbon. JEFF UBBEN: We announced a private investment in the Spring Fund yesterday: Nikola Motor, which is a long-haul hydrogen truck company, and they sell on a per mile basis. So, they’re beating– because they’re sourcing clean energy off the grid in the middle of the day at 2 cents or what have you, and they put it into a tank and are storing it and the trucks off take all night long, you know, with an eight-minute charge to go 500 miles, because that energy is so cheap, they’re beating diesel handedly today on a per mile basis. And then, those in the trucking business still on diesel, if we reprice carbon, Nikola is a $300 billion company, right? Because they had the infrastructure in place, the re-fueling infrastructure in place and this is kind of a first mover advantage to do it – to having it because you’re not going to overbuild their infrastructure. DAVID FABER: And you haven’t even talked about autonomy yet. When it comes to trucking, there’s obviously an opportunity there, too. JEFF UBBEN: Right. Then pretty soon they’ve got all of i-80 with refueling stations and they’re moving the truck autonomously and it’s totally zero carbon and it’s probably the best application for autonomous. And then you undermine all the logistics as we know it: trains, you know, jet fuel. That’s the big mega play and it’s all about the environmental and social footprint. DAVID FABER: And there are people willing to put money there? And there are people willing to put money into the Spring Fund as well? I mean, you can actually scale to a level that allows you to make meaningful investments and generate a real return? JEFF UBBEN: You know, it’s not an easy sale because the moralists are like ‘Why are you in the wood pellet business because you’re cutting trees down?’ My point is ‘Well, it’s a decarbonized technology. It might not be the answer but it’s better to move off coal faster.’ So, the moralists maybe don’t like it. And then the guys like you that are fiduciary duty guys say, ‘Well, how do you know you can get a return?’ And it feels like ValueAct in 2000 when people were like, ‘What is this act thing and why do boards listen to you?’ and the other guys wanted me to hedge with shorting stocks. and I said, ‘I’m not going to do that.’ And so, maybe you grow slowly as you prove it out. DAVID FABER: Jeff, we’re out of time, unfortunately, but always appreciate your willingness to take a little time with us. Thank you. DAVID FABER: Jeff Ubben, Founder and CEO of the 12 plus billion dollars ValueAct. But you heard us talking a lot of course about some of the other investments they’re making as well. Back to you guys.